Our magnetic calendar, monthly planner, schedule board is made to fit on ANY kitchen refrigerator, thanks to its sturdy magnet. There is ample surface to allow you and your family to efforlessly write, erase, rewrite and exchange ideas, notes & messages. Write down your grocery list, appointments, messages and any upcoming birthday you want to remember. 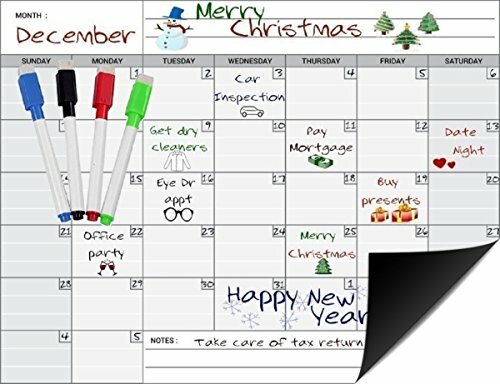 Erase your magnetic calendar surface with its magnetic eraser and get a fresh start! Number each day of the month and stay on track of your plans, for many years to come! We stand behind every one of our products for durability and effectiveness. If for any reason you're unhappy with your magnetic calendar, you'll be entitled to a prompt refund or exchange - whichever you prefer. Includes: 4 Magnetic Dry-Erase Markers. Black, Blue, Green and Red! Stylish & Attractive: Your 17 x 13 inches Calendar will fit on any refrigerator, mini or full size. Your magnetic calendar will flatten onto your fridge with minimal effort. Organize Your Busy Family Schedule. This is a must have for your family.This planner will help you organize those family activities, grocery lists, appointments and busy schedules. Carefully Packaged: With our Magnetic Board, you can be confident that you'll receive an item packed in a sturdy box and in pristine condition.